Contemporary American cuisine from chef John Fraser at The Times Square EDITION. Coffee counter and butcher shop with dinner service, too, in Gowanus. Astoria cocktail bar offering food, too, ranging from fried calamari to filet mignon. A cozy, pretty shrine to Champagne and sparkling wine in the Village. Greek seafood and wines in Astoria. Dine-in movie theater in downtown Brooklyn. Williamsburg restaurant offering a seafood-focused menu from chef Pete Lipson. Prospect Heights Mexican restaurant from chef Akhtar Nawab. Pasta, pizzas and more Italian fare on Spring Street in SoHo. A fun Mexican haunt near Columbia University. Greenpoint restaurant offering American fare and beers, wines, ciders and spirits made in New York State. Plant-based Japanese-inspired eats from Matthew Kenney in the East Village. Modern Indian food with a global twist in Chelsea. American fare --- BBQ shrimp to rib-eye --- across from Barclays Center. Upscale Chinese restaurant on the Upper West Side serving food from chef Kaiyuan Li. Elegant fine dining Korean restaurant from husband-and-wife team Junghyun and Ellia Park. Brendan Sodikoff's famed hamburgers come to New York City. A Manhattan version of Alinea Group's innovative cocktail bar at Mandarin Oriental, New York. Brooklyn eatery featuring avocado in everything from ceviche to smoothies. Looking for Indonesian food? Find it in Elmhurst at this Queens Boulevard eatery. Indian street food-inspired dishes are offered in an airy, modern space in Hell's Kitchen. Breakfast pizza is offered in the morning and slices and espresso are served all day at this Hell’s Kitchen eatery. Flatbread wraps stuffed with spit-roasted meat are offered at this Time Warner Center eatery from David Chang. Pizza and small plates are offered at this Harlem eatery. Alaskan-themed bar on the Lower East Side. Creative cocktails, ramen and more await at this Greenwich Village bar. All-vegetarian menu and live music on weekends, too, in Brooklyn. Northern Italian cuisine is served in a classic-feeling setting at this Midtown East restaurant. Meat-centric omakase menu from Masa Takayama in TriBeCa. Seasonal American cuisine at The Renwick in Midtown East from chef John DeLucie and his wood-fired grill. Intimate chef’s table dining in Harlem. Jonathan Benno's refined restaurant in The Evelyn hotel showcases flavors from the Mediterranean. West Village restaurant celebrating the diverse flavors of Africa. Retro spot in Greenpoint serving up burgers, martinis and more. West Village restaurant where the chef creates each guest's dish on the spot. Farm-to-table American restaurant in Park Hyatt New York. Manhattan outpost of the Brooklyn bakery offering crusty French breads and more. Find pizza, antipasti and salads at this East Village eatery. All-day French bistro fare in the West Village. French bistro in the SIXTY SoHo hotel. Union Square café serving food and hot chocolate all day. West London culinary hot-spot makes its way across the Atlantic to NYC. This Texas steakhouse makes its Manhattan home in the Omni Berkshire Place. Pizza and Italian eats in the heart of Union Square. SoHo restaurant from Floyd Cardoz takes inspiration from Bombay's street food scene. Crêpes, wine and French hospitality near the 92nd Street Y. This Barcelona food market-inspired Spanish restaurant livens up New York City's Midtown culinary scene. Clubby East Village steakhouse with an opulent vibe. The Taiwanese dish luwei is featured at this East Village restaurant. French brasserie with Korean flair from chef Sung Park in Boerum Hill. Indoor-outdoor bar in South Williamsburg offering burgers, tacos, and plenty of dancing at night. Fast-casual chicken restaurant in Chelsea. Steaks, Chinese dumplings and more are on offer at this Financial District restaurant. Cider house, bar and restaurant in Bushwick. Burgers and lobsters are indeed on the menu at this Manhattan outpost of the London chain restaurant. All-day café serving veggie-based food, smoothies, brunch and wine. OPENING TBA --- A sandwich shop from Dewey Dufresne. A sleek, European-esque space on Lexington Avenue from the Martignetti brothers serving breakfast, lunch, dinner and cocktails. Northern Mediterranean fare at Hotel on Rivington. Sustainable-minded restaurant in South Slope, Brooklyn. Cocktail lounge serving snacks and bar food in Murray Hill. NoMad restaurant offering a menu that highlights Italy’s Cardoncello mushroom. Casino Clam Bar reimagines a seaside clam shack in Brooklyn. Pan-Mediterranean fare at this Dumbo restaurant with views of the Brooklyn Bridge and Manhattan. Fresh seafood and Iberian Peninsula-sourced wines are featured at this LES restaurant. Pastry chef Pichet Ong's Hell's Kitchen spot serves up a modern take on Chinese food. Flatiron District pâtisserie offering sandwiches, afternoon tea and a nighttime dessert tasting menu. Vietnamese fare in New York's East Village. NoLIta café offering breakfast and lunch fare, from toasts to colorful bowls. Fifty cheesecake varieties and a 250-plus-item menu at The Cheesecake Factory’s Elmhurst location. Casual and comfort food recipes from a global array of top chefs brought to you by the team behind Chefs Club. French fare in Greenpoint from chefs Aidan O'Neal and Jake Leiber. TriBeCa-based sister venue to City Winery offering local wines and Hudson River views. Oaxacan fare on Third Avenue in Gowanus. Hong Kong-style clay pot cooking on St. Mark's Place. Coffee shop, bakery and pizzeria in Gotham West Market. Hotel 50 Bowery's rooftop spot offers Asian-inspired cocktails and small plates of global street food. Crown Shy makes its home in a landmarked Art Deco tower in the Financial District. Russian dumplings at the Turnstyle Underground Market. Japanese all-day café in the Lower East Side. Seafood with South American inspiration in Sunnyside. Food hall comprising 40-plus vendors in downtown Brooklyn. Wine bar and small plates restaurant in Williamsburg. Restaurant and cocktail bar from Oliver Zabar on the Lower East Side. Wine bar in Hell's Kitchen offering a menu with options like American artisanal cheese and steak bavette. Cozy secret restaurant inside Garret East serves an inventive menu and great cocktails. Like to eat cookie dough straight out of the bowl? Head to this shop on LaGuardia Place. Scott Tacinelli and Angie Rito's modern take on Italian-American food in the West Village. Wagyu katsu sando spot in the Financial District. Sandwiches, frozen cocktails and more await at this Greenpoint spot. Drunken Dumpling brings giant soup dumplings to the East Village. Pot stickers, dumplings and bubble tea in SoHo’s Broadway Market. Greek restaurant on the Upper West Side. Single-origin coffee and house-made pastries in Williamsburg. Bistro offering Mediterranean flavors with a hint of Latin influence. Grill fare, sushi and sweeping views at Ravel Hotel in Long Island City. Williamsburg seafood restaurant and bar serving lobster rolls and craft cocktails. Filipino barbecue spot on Brooklyn’s Smith Street. Burgers and other simple farm-to-table fare are offered at this Times Square restaurant. Italian cuisine and wine on Brooklyn’s Flatbush Avenue. Italian restaurant in the Moxy Chelsea hotel. Greg Proechel's quirky New American restaurant in the basement of NoMad's MADE Hotel. Comfort food is served until late at this Upper East Side tavern. Find modern American cuisine at this Lower East Side restaurant and bar with 1970's-inspired décor. Rotisserie chicken is the heart of the menu, and the wine list focuses on natural bottles and small producers. Steakhouse classics from Chicago restaurateur Brendan Sodikoff in the West Village. American cuisine is offered at The Four Seasons Restaurant in midtown. Mumbai’s famous street food, the frankie, is the focus at this SoHo eatery. Meatpacking District café serving Portuguese coffee and pastries. Modern French bistro in TriBeCa serving updated classics and natural wines. Lower East Side restaurant offering a tasting menu from chef Flynn McGarry. Noodle-focused Sichuan restaurant in Bushwick. All-day restaurant in Williamsburg with a retro feel. Seasonal outdoor restaurant and cocktail bar drawing inspiration from Tulum, where the spot has its original location. Diner classics and remixes populate the menu at this Lower East Side eatery. American classics served all day in Gramercy. The coastal cuisine of Italy is offered at this NoLIta restaurant. Creative cocktails poured nightly in Brooklyn. An edible celebration of all things Scandinavian at Grand Central. American fare served amid patriotic décor in the West Village. Brooklyn brewery and taproom offering Grimm Artisanal Ales. Gumbo and po' boys from New Yorkers by way of Louisiana. Bombay-inspired restaurant and cocktail bar in Gramercy. Hand-rolled bagels and prepared sandwiches on the Upper West Side. Adventurous Vietnamese cooking on St. Marks Place. Chinese barbecue, noodles and more are offered at this Chelsea restaurant. Harlem Hops showcases beer made by small batch and family owned breweries. Mediterranean-inspired food, natural wine and cocktails in Bed-Stuy. Home-style Korean cooking in a cheerful, pretty space. Hill Country Food Park is a collection of food stalls serving fare from nachos to barbecue. Brunch fare begins the day then gives way to small plates and cocktails at this Financial District spot. American restaurant and sports bar in Kips Bay. Healthy food is the focus at Honeybrains in NoHo. Pancakes, pork schnitzel, cocktails and more are offered at this Crown Heights eatery. Modern Korean food in Gramercy. Sustainably harvested seafood at this Reykjavik import in the West Village. Italian restaurant with indoor and outdoor seating on the Upper East Side. Greenwich Village outpost of the Lower East Side gelato lab. Indian restaurant offering shareable small plates and creative cocktails in the Upper East Side. Upper East Side café serving coffee, pastries, sandwiches and more. Café and restaurant owned by Lexus, and in collaboration with Union Square Hospitality Group, in the Meatpacking District. Classic cocktails and nibbles at The Lowell New York. Manhattan outpost of the beloved Staten Island pizzeria Joe & Pat’s. OPENING TBA --- Fine dining at luxury residential tower One Hundred East Fifty Third Street. Morningside Heights eatery serving up chun bing pancakes and noodles. Greenwich Village Japanese bar that complements the drinks with bites, “sandos” and skewers. Temaki (freshly made hand rolls) from the SUGARFISH team in NoMad. Panamanian restaurant in the East Village. Kellogg's café on Union Square offering cereal varieties, milkshakes and more. Williamsburg bar offering more than 125 different rums. Hell's Kitchen spot for burgers and hot dogs made with 100 percent American Wagyu beef. Couscous-focused eatery in the West Village. Clams, cocktails, a rooftop bar and more on Coney Island's boardwalk. All-day restaurant in Williamsburg's The Hoxton hotel. Isan street food of Northeastern Thailand is served at this Brooklyn eatery. Greenwich Village eatery featuring kushari, an Egyptian street food. Airy Greek taverna in the Flatiron District. La Central restaurant at Hôtel Americano features Latin American fare. All-day and late-night Mexican fare in the West Village. Tacos, guacamole, margaritas and micheladas are offered up at this Midtown West taqueria. Brooklyn eatery offering Mexican fare and cocktails. Japanese/French confectionery offering cocktails and small savory bites, too, in the West Village. Impeccably designed French restaurant with an all-day menu in the Roman and Williams Guild furniture and design store in SoHo. Mexican deli, mezcal/tequila bar and listening room in Williamsburg. Pizzas and pastas headline the menu at this downtown Brooklyn spot. On Bayard Street in Chinatown, Lalo offers food that takes inspiration from a number of culinary traditions. Chic yet affordable Thai from chef David Bank on the Upper West Side. Bar and lounge in the Meatpacking District. Charming restaurant featuring a seasonal Italian menu in Greenpoint. Hudson Yard’s Legacy Records hits a high chord in a burgeoning neighborhood. A seafood shack done upscale in Moxy Times Square hotel from the TAO Group. Chef Jonathan Benno’s Roman-inspired trattoria and cocktail bar in NoMad's The Evelyn hotel. Elegant Upper West Side restaurant serving Italian cuisine from chef Adam Leonti. Fresh-baked goods ranging from cookies to country rolls in the Upper West Side. Live broadcast restaurant on Flatbush Avenue in Brooklyn. Peruvian sandwich shop in the West Village. A second location of New York's first pizzeria, this one in Chelsea. Hidden bar in Midtown's Hotel 3232. Cocktails with a view at this sleek Midtown East lounge. H.P. Lovecraft-inspired steampunk theme bar and restaurant with a well-executed New American menu. Oysters, po’ boys and other New Orleans-inspired eats in Brooklyn's Prospect Heights. Find pho, green papaya salad and more at this East Village Vietnamese spot. Daniel Humm and Will Guidara go fast-casual. Industrial-chic design and elevated comfort fare marry at this Midtown East spot. Neighborhood bistro in Harlem with a fun vibe and great burgers. Neighborhood brasserie serving traditional and modern French fare. Filipino restaurant in the East Village. Upper West Side spot offering garlic rolls, panini and pizza. In the Financial District, a restaurant from Danny Meyer's Union Square Hospitality Group, 60 floors up. Cafeteria-style Italian spot in midtown. NoMad spot offering poke in either a bowl, burrito, hand roll or salad. An Italian-inspired menu is offered at this Hotel Hugo restaurant. An unfussy, comfort food-focused Italian spot, serving spaghetti with meatballs and eggplant Parmigiana. Boca Raton import serving steakhouse classics in NoMad. Omakase sushi dining featuring local and sustainable seafood. Brasserie-style American restaurant in the Meatpacking District. Nostalgic, hip American restaurant in Prospect Heights. Inspired by the studio eateries from Hollywood’s golden age, a Lower East Side movie theater, bar and restaurant. A neighborhood French restaurant in Greenwich Village. New American fare on the Lower East Side. Israeli cuisine restaurant in Greenwich Village. South Williamsburg restaurant highlighting the house-made pasta dishes of Missy Robbins. Veggie and fish-focused restaurant in a soaring Philippe Starck-designed space in SoHo. Brooklyn location of chef-owner Danny Bowien’s Mission Chinese Food. Cocktail bar with a food menu, too, in the East Village. Two-level Upper West Side eatery offering Mediterranean fare. Park Slope outpost of the Chelsea Market spot offering ramen and anju (shareable dishes). Momofuku Noodle Bar's uptown outpost features David Chang's flavorful breads, noodles and rice dishes. Chef Masaharu Morimoto turns out ramen at this Murray Hill spot. Thoughtful Thai dishes in Ditmas Park. Chelsea neighborhood spot featuring seasonal American eats and craft beers. Upper West Side outpost of the Neapolitan pizza spot. New Orleans-inspired restaurant in the East Village. Build your own mac and cheese dish at this West Village eatery from Murray’s Cheese. Japan meets Italy at this stylish Kips Bay bistro. All-day café in the Dream Downtown hotel in Chelsea. Dive into Greek seafood in New York's West Village. Italian-American restaurant in Hell's Kitchen with a menu that ranges from arancini to grilled branzino. Omakase dining experience and a Japanese whiskey and saké lounge in NoMad. Kosher dairy cuisine is served at this Sago Hotel restaurant. TriBeCa restaurant highlighting pasta, especially its famous tortellini. Yakitori spot in NoMad offering udon and sushi, too. Williamsburg restaurant highlighting the cuisine of southern Thailand. Restaurant helmed by chef Saul Bolton in the Brooklyn Museum. Seasoned restaurateur Salvatore Fraterrigo brings the cuisine of his native Sicily to Murray Hill. Norman offers self-service breakfast and lunch dishes in Greenpoint’s A/D/O building. Pizzas made with hand-stretched dough are turned out at this Upper East Side shop. Upper West Side pizza place offering classic pies, seasonal specials and more. OCA Positive Food offers Brazilian tapioca crêpes in SoHo. Choose from poke bowls and pick-your-own combinations at this Midtown spot. Kips Bay goes global with an izakaya courtesy of chef John McCarthy. Intimate, 500-square-foot spot by sushi master Tatsuya Sekiguchi featuring a daily omakase. Modern jeongol, a Korean-style communal hot pot, is the star of the show at this NoMad restaurant. NYC spinoff of the historic Tennessee country music spot Grand Ole Opry. Bushwick pizzeria with a natural wine list. American cuisine and craft cocktails complemented by Manhattan views at this Brooklyn hotel restaurant. New American cuisine is offered at this Clinton Hill restaurant. Mediterranean restaurant on the Upper West Side from the team behind Molyvos and Oceana. Chef Floyd Cardoz and Indian cuisine reunite at this SoHo restaurant. Cocktails, beer, wine and bites like spicy spare ribs in the East Village. Lower East Side restaurant drawing inspiration from New Orleans’ French Quarter. Drinks and Mexican food along with plenty of outdoor space in Gowanus. Fast-casual pasta restaurant in the Financial District. Near-Times Square outpost of the Upper East Side Jewish deli. Old-school New York slice joint in Brooklyn. Teppan eatery in Midtown West. Mediterranean cuisine restaurant on Graham Avenue in Brooklyn. Quality Vietnamese cuisine is offered at this Chinatown eatery. Find Italian fare highlighting seafood at this SoHo spot. Chinese fare, including soup dumplings, along with cocktails and wine in SoHo. All-day vegan café from chef/owner Matthew Kenney in the East Village. Customers choose the dough and style of pie at this NoMad pizza spot. Gelato, coffee and pastries shop in Little Italy. New American restaurant in midtown named after the mythological goddess. Roman pizza guru Angelo Iezzi offers square slices on the Upper East Side. Nashville moves to NYC in this music venue-restaurant. Wood-oven pizzas, small plates, craft cocktails and more in Midtown West. Seasoned chef and grillmaster Jared Male pairs American-style barbecue with longstanding New York City favorites at his Lower East Side restaurant. Lower East Side bar featuring cocktails based on Korean spirits. Italian sandwich shop and deli in the LES. New Nordic meets New American at Noma co-founder Claus Meyer's casual spot in Grand Central Terminal. Upscale rooftop dining in a stylish four-story furniture and design showcase. Spit-roasted meats, seafood and more from restaurateurs Bruce and Eric Bromberg in the Theater District. Vegan diner in Brooklyn offering meatless takes on comfort food. Neapolitan “farm-to-table” pizza in the West Village. Veggie-centric restaurant in Chelsea featuring 1,600 bottles of wine. Charming Gowanus neighborhood all-day bakery, café, restaurant and bar. Brooklyn Navy Yard outpost of the historic NYC appetizing spot. An homage to Northern Indian cuisine from chef Hemant Mathur on Lexington Avenue. Seafood restaurant with a cozy back patio serving oysters and whole roasted fish. First NYC branch of the Korean barbecue restaurant launched in Seoul in 1976. Fun Middle Eastern restaurant and market in Williamsburg. Red Hook tavern with a mahogany bar and a menu ranging from tamales to tacos. Toshio Suzuki again delights NYC with this 10-seat Theater District omakase restaurant using fish from Japan's Tsukiji market. Southern Italian-inspired comfort food in a casual, hip Lower East Side spot. Midtown speakeasy located within Pomona restaurant. Nautical-themed restaurant in Dumbo serving oysters, paella for two and local seafood. Inwood seafood restaurant with a 500-gallon aquarium. NYC-based Italian restaurant chain expands to Ludlow Street. Shanghai soup dumplings highlight the menu at this Queens restaurant. American cuisine for breakfast, lunch and dinner in NoMad. Ramen restaurant at Wyndham Garden Chinatown. Kaiseki and sushi omakase dining experience in TriBeCa. NoLIta spot offering Mediterranean fare for dinner and brunch. Neighborhood Italian fare on the Upper East Side. Hunan cuisine on 13th Street in the East Village. Tandoori is just the start of what’s on offer at this bright, lively Indian spot in Midtown East. All-day Nordic café in the East Village. Persian home cooking in Prospect Heights. Chef Wylie Dufresne is the culinary advisor for this fast-casual Indian restaurant. Asian-fusion fare offered for lunch and dinner in Chelsea. All-day café in the Lower East Side. Korean with a French spin from chef Soogil Lim in the East Village. Pizzeria from Gino Sorbillo on the Bowery. Most dishes are cooked with the sous vide method at this Flatiron eatery, where customers order from a digital kiosk. Chinese noodles in Greenwich Village. West Village restaurant and bar offering dinner fare until 2 a.m. Seasonal comfort food in a cheerful, casual spot in Midtown East. Quality Branded has gotten in the nightclub game with Squares in The NoMad. Wine bar in the West Village with a food menu that roams from charcuterie plates to risotto. All-day restaurant in the Freehand New York hotel. Australia-inspired Asian fusion fare, cocktails and wines by the glass by the South Street Seaport. A 150-year-old Empire Stores landmark building in Dumbo houses this outpost of the Miami-based small-plates restaurant. Omakase sushi counter at Gansevoort Market. High-level sushi restaurant with a noted Japanese chef in Harlem. Sushi and saké on Sixth Avenue in the West Village. Weekday omakase dining in Midtown (reservations required for sushi bar). Movie theater and restaurant in Bushwick, Brooklyn. Colorful tacos are served at this Union Square eatery that sports plenty of neon and a DJ booth. Chef Thomas Keller's TAK Room channels vintage glamour at Hudson Yards. Food of the Thai countryside is highlighted at this Hell's Kitchen eatery. Excellent oolong tea and beyond-your-average-tea-room bites at this charming West Village spot. A cozy café in Brooklyn from Alex Raij and Eder Montero. Mexican street food and margaritas in Chelsea. Fast-casual eatery serving plenty of salad along with all-American fare in Union Square. Fast-casual restaurant at The Africa Center in Harlem. All-day restaurant from chef John Fraser in The Times Square EDITION hotel. Masayoshi Takayama's TriBeCa spot for nigiri, shareable Japanese dishes and cocktails. Find New American fare offered via small and large plates at this Lower East Side restaurant. Southern-inspired eats and craft cocktails in an arty West Village spot. This East Village spot makes pizza inspired by the town of Tramonti, near the Amalfi Coast in southern Italy. Shanghai noodles and soup dumplings meet Szechuan cooking on the Upper East Side. Classic midtown steakhouse with dry-aged beef and Italian touches. Sirichai Sreparplarn's Thai food in a bright, friendly Carroll Gardens spot. Experience a "deconstructed omakase" meal at this Brooklyn restaurant. Destination pizzeria from Anthony Mangieri on the Lower East Side. Bar and lounge underneath Korean barbecue restaurant Cote in the Flatiron District. Cocktail bar serving fun drinks along with bar food in Clinton Hill. A rooftop lounge on the top floor of Hyatt Herald Square New York with a spectacular view of the Empire State Building. Hip spot for Filipino and Pan-Asian-inspired American comfort food in The Nolitan Hotel. East Village restaurant offering Vietnamese cuisine. Modern Mexican cuisine and creative cocktails in Midtown. New American cuisine highlighting seasonal produce in the East Village. Danny Meyer's Roman-style aperitivi bar serves bubbly by the glass and a selection of fried snacks. Tapas and sangría await at this Murray Hill neighborhood spot. It's all about Rhode Island-style grilled pizza at this tiny East Village spot from the Emily team. West Village restaurant offering Greek food, wine and spirits. Swanky cocktail bar in a glass structure built to look like an iconic water tower, with a rotating set of DJs. 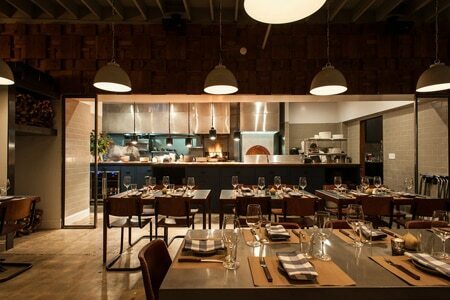 All-day restaurant located at Innside New York Nomad. Korean and Southern American flavors meld at chef Sung Park's Windrose. Izakaya fare, sushi and cocktails, plus a small retail shop, in Murray Hill. Upscale Korean cuisine and barbecue from a family that’s had Korean restaurants in NYC for three generations. International comfort food in Hell’s Kitchen. Longtime NYC chef David Burke's restaurant features a wood-burning oven and cricket pizza. Restaurant and cocktail bar in the Woolworth Building. Veggie-centric, seasonal café located in the scenic landscape of the Brooklyn Botanic Garden. OPENING TBA --- Fish for your dinner at the first NYC outpost of this Japanese chain. Upper West Side taco shop also offering noodles, poke and more.